Provide Fresh Drinking Water to Pets What’s the Best Way? 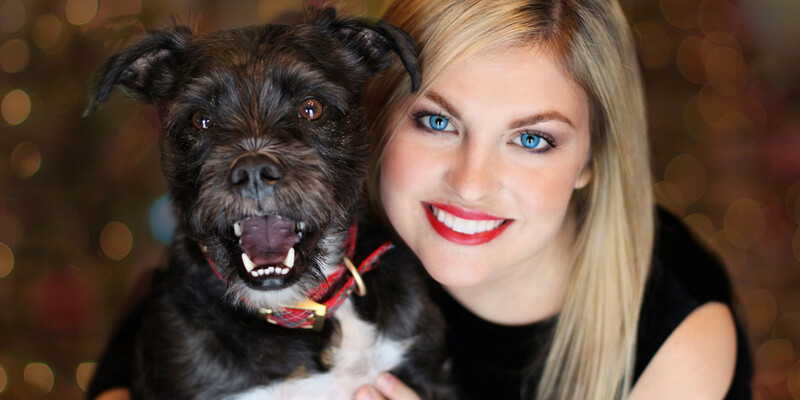 As a pet owner you know you need to provide fresh drinking water for your dogs or cats. Sometimes it can be a little bit of a challenge, not because water is hard-to-find but because you may be very busy and you’re not able to keep the dish full and clean. Well there are some options for you so let’s go over them. Obviously you know about water bowls and they make some simply darling water bowls for dogs and cats. And if you have one pet and you don’t work long hours this may be perfect for you. However if you have more than one pet you are probably filling the bowl up at least once a day. The second kind of water dispenser is those with a reservoir and you may have seen them they have a big bowl and what looks like a soda bottle or something like that on top. Those are nice too because obviously it can hold more water and you won’t have to fill it quite so often. But is that the freshest water? Your third option is a pet fountain they have a good size reservoir, a nice big bowl and the water circulates and keeps it fresh. Most pets like drinking fresh water that comes from a tap. You may have a cat that likes to drink out of the faucet when it’s running. If this is true your cats will really enjoy drinking out of a Pet Fountain. Fresh water is something that is beneficial to all living creatures. That includes your pets and giving them fresh water is something you should take seriously. Most people drink bottled water for themselves and leave their furry friends with water straight from the tap. This type of water may have impurities in it and the health of your pet may be on the line if you keep giving them water that is not fresh. The trouble with this is you may not be aware the water is not the healthiest. The benefits of fresh water for your pets are many, but the main benefit is obvious, it prevents diseases. Diseases can be contracted by your pets if they drink harmful water with impurities in it like chlorine and metals. A way to make sure that this doesn’t happen is to supply your pets with healthy fresh water from pet drinking fountains. The impure water may also contain and harbor parasites and bacteria that might be harmless to human beings but deadly to your pet, making them go through diarrhea, sickness and worst of all, malnutrition. Another benefit of fresh water is that your pets, especially dogs and cats, is that it causes them to drink more water. Fresh water ensures that your pets are always hydrated and in a healthy state. The oxygen in water gets lost as it is exposed to air, and this makes it less appealing to pets. So if the water your giving your pets has been exposed to the atmosphere for extended periods of time and tastes bad, your pets will drink less of it and might end up getting dehydrated. Fresh water keeps your pets hydrated and therefore should be offered continually. While there is a debate among pet owners if using a pet fountain to supply water is more beneficial than using a water dish. Why? Well, the benefits have already been listed (you know, the benefits of fresh water for your pets) but pet fountains have additional elements that make them ideal for pets, for instance, they have a charcoal filter. The filter gets rid of the bad odors and tastes, ensuring your pets get fresh water. The water inside a filter continuously circulates preventing bacteria from growing. Another benefit of using a water filter is that it reduces the hassle of frequently replacing the water for your pet. The water in the fountain lasts a couple of days whereas the charcoal filter lasts for about two to four weeks. A water dish does not have these advantages and hence is less appealing and even less healthy for your pets. Studies show that since pets like dogs and cats enjoy drinking fresh running water, they will live healthier longer lives when they do. 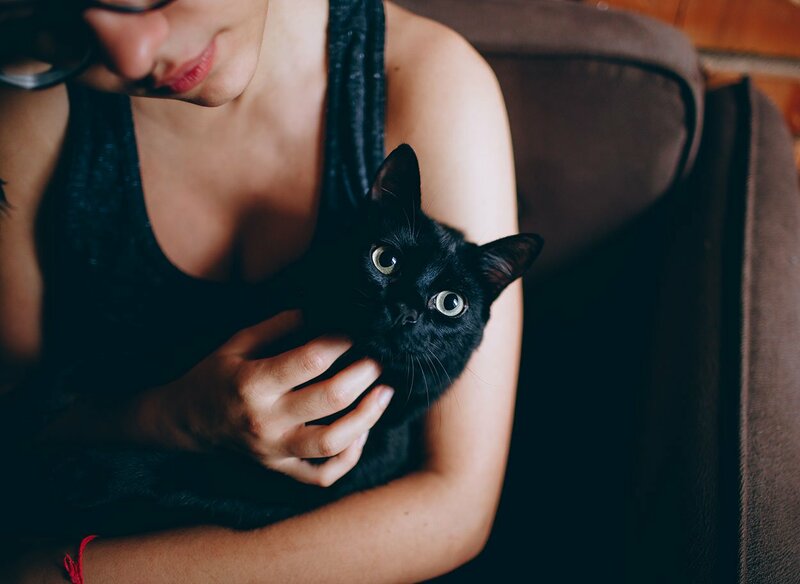 Pets are just like family members and it is therefore the sensible thing to do to give them water that you would give to any other family member. Supplying your pets with water that is fresh, filtered and purified on a frequent basis enables you to make sure that they easily avoid problems from water that has been exposed to the atmosphere for a while or from water that is impure and has bacteria or parasites. Using a pet fountain as compared to a pet water dish is more beneficial as it provides the pet with pure, fresh drinking water that ensures it even has an extended life span. Most veterinarians recommend them, making their use a healthy option for your pet as compared to water dishes. The Drinkwell Platinum Pet Fountain is a hit with both dogs and cats alike, it holds count ’em 168 ounces of water (over a gallon) in it’s reservoir do you know how many trips to the sink that will save you? Most folks really like this pet fountain and while they mention it’s not a snap to clean you get quicker the more you do it. On the other hand folks say it’s easy to clean since it’s dishwasher safe (take the suggestion to use the top rack only). The only answer I can give to that is consider you would have to clean any container you put your pets water in, and it’s bound to be saving you time by not constantly filling it up – no comparison. The pump is submersible which makes it quiet and helps the water to circulate. The AC cord is six feet long making it possible for folks counter only receptacles to use the pet water fountain. The Drinkwell Platinum Pet Fountain is for indoor use only. Pets learn to use the Drinkwell Platinum Pet Fountain quickly, and the health benefits from drinking fresh filtered water is wonderful. Most city water has extra additives that aren’t healthy for you or your pets. If you filter your drinking water and you should, then you also will want to filter your pets water using a pet water fountain. Many owners feel that using ceramic bowls prevent cats from getting chin acne because they have an allergic reaction to plastic, while I’ve never had that issue if you have then consider getting the Pioneer Pet Fountain in ceramic or stainless steel they have less nooks and crannies than the Drinkwell Pet Fountain which makes them easier to clean and can be placed in the dishwasher. One drawback to the ceramic obviously is it is breakable you will want to be careful when picking it up and putting down on the floor. Since it’s ceramic it will be heavier – your cats or dogs cannot knock it over, or possibly budge it. The pioneer comes in a sleek raindrop design that you may find more attractive than plastic fountains and will look fantastic in any kitchen. The Pioneer Pet 6022 Ceramic Drinking Fountain holds 60 oz of water and comes in a stylish black finish, with replaceable charcoal Pioneer Pet fountain filters that are reasonably priced so your pets always have fresh filtered water. If you like the idea of not using plastic but are leery of ceramic and the possibility of it breaking consider the Pioneer Pet Raindrop Stainless Steel pet drinking fountain it is made of top notch stainless steel so you can have the peace of mind knowing it won’t break and it too will look stunning in your kitchen. 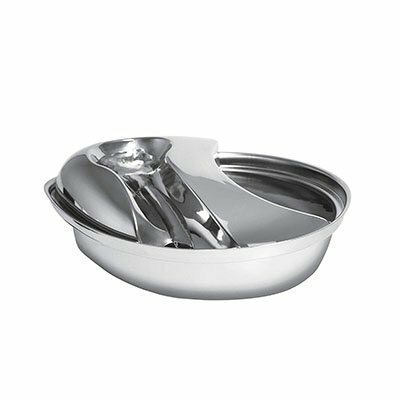 The added plus of the stainless steel is you can have your older children take responsibility of keeping the bowl clean without worrying it they will break it. Cons because of its unique design I feel there is less space for your cat or small dog to drink from as opposed to other fountains with larger bowl features, however this is just my opinion. If you feel the same way you’ll be happy to know that the same company makes the Pioneer Pet Ceramic Big Max Pet Water Fountain. It has the same beautiful design but with the full bowl that holds 128 oz of fresh drinking water. The open design might be easier for multiple pets to drink from plus it you can get the stainless steel model as well. All of these pioneer products use the same charcoal filter which it makes a convenient if you decide to get a Big Max and or the raindrop style. The majority of the people that have purchased this product have been extremely happy with the purchase. The Petmate Water Fountain gives your cat or dog fresh filtered water for a happier and healthier pet. Owners say one of the best features is its super quiet motor. With a 50 oz. reservoir (clear so you can tell when it is getting low) in total the Petmate Water Fountain holds 108 oz. (13.5 cups) of fresh clean filtered water. If you do not have a filter on your faucet (like a Brita) then consider getting one for your own health as well as your pets. You could also use bottled water (which is what I use) this keeps mineral deposits from building up on the fountain and helps to keep it clean longer depending on your cat or dogs habits. 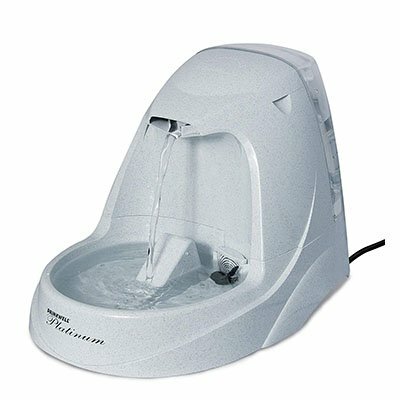 If your cat or dog is hesitant to try the pet fountain leave it unplugged next to the regular water dish for a few days. You then can plug it in and they should drink from it, if they still are apprehensive then place a little treat on the edge of the drinking fountain to encourage your pet to drink more water or any to begin with! If your Petmate Fresh Flow Pet Fountain unit is giving you some troubles here the most common problems and the solutions. Sometimes dirt, particles of food or even cat hair can slow your pump down, so fountain cleaning generally restores the fountain back to normal. One note when you plug the fresh flow fountain for the first time may take 2 - 3 minutes to remove the air before the water comes out. What if your cat likes drinking from the sink? Water from the Petmate fountain circulates and oxygenates the water which is perfect for your cat. However, if you have to drip water from your bathroom faucet your cats may like the Drinkwell Fountain better because of the streaming water. The simplest solution is a plain dish of water, which you should clean, and change stagnate water everyday so bacteria doesn’t build up. One item to note is the bowl itself make sure it is ceramic, stainless steel, or a non porous plastic some plastic is porous (like an over used cutting board) and once it scratches bacteria can set in and infect your cat. Other types of water dishes are the kind that use pop bottles and gravity to hold water. Which seems awkward since you have to turn them upside down to get the water bottle in the hole and then you have flip it back (hopefully you got the threads screwed in correctly). Again the water gets stagnate and your cat may not drink it after a day or two so it seems filling it up is pointless unless your cat is drinking it. Having a cat drinking fountain can increase the amount of water your cat drinks. The cat drinking fountain allows aerated water to flow through the fountain using a pump so the water doesn’t get stale. 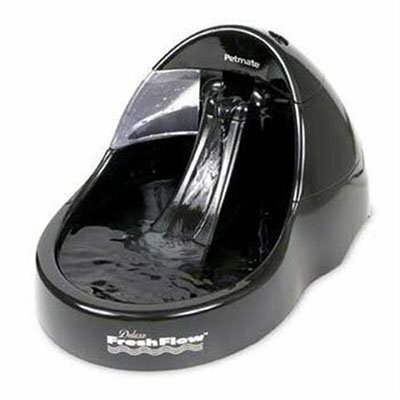 Depending on the brand you choose the water flows in to the bowl and others like the Drinkwell Pet Fountain the water flows down through a stream into a bowl which allows your cat to have a choice of water to drink. Most cats are fascinated with the flow of water and will drink right from the stream. Pet fountains also use charcoal to filter and remove impurities, improve taste, and removes odors, charcoal is used in the purification process of many industries. Before you purchase a cat drinking fountain check on the price, availability, and how often you need to change the filters. A cat drinking fountain is perfect for busy people the last thing need to worry about is whether you filled the water dish before you left the house. Generally, drinking fountains hold at minimum 6 cups of water so that you can rest assured the cat has water. Pet fountains are made for multi-pets with larger reservoirs and others are made for one or two cats, or small dogs. Is a cat drinking fountain noisy? Some cat drinking fountain owners mention the noise factor. Yes, the pump will make a gentle noise of flowing water, however the pump will become noisy when the water level is getting low, just add water and the noise will lessen. If your unit is still making noise check the parts they may have hair around them and need cleaned. Occasionally the unit will hum a little more than usual and giving it a little scoot to the left or right may do the trick. Is a cat drinking fountain easy to clean? Clean up is easier obviously with a bowl but many drinking fountains parts are dishwasher safe, you may want to buy a set of cleaning brushes to get inside any nooks and crannies. If you have hard water you may want to clean the unit more often you can use white vinegar and soak the parts or run through the machine – be sure to remove your filter before you do. Fountains should be cleaned at least every two weeks, although you may not be able to see it, cat hair can accumulate around the parts and cause it to clog and make more noise. Will my cat like the pet fountain? Cats are naturally curious and should take to the fountain within a day, although some cats are a bit more timid than others and make take a few days to warm up to the new “thing?. You can try placing a few ice cubes in the bowl to see if the cat will get closer. Thousands of cat drinking fountains have been sold and in all the reviews I’ve checked very few cats were afraid to use the fountain. When I brought home my 2-month-old kitten, she drank from the fountain immediately, and with no fear, my two other cats took to it right away as well. I hope you can see the important role a cat drinking fountain can play in the health and well-being of your cat. The one I have, I work with animals and I love my job and can't picture myself doing anything else! I wake up everyday and enjoy going to work, I get to do things most people could only dream about... I'm a zookeeper.